Posted July 29, 2017. Filed under Art Workflow, Materials. Tags: artflow, background map, material, OSG, sky, skydome, texture. Many scenes benefit from having a skydome in the background - an image of a sky that replaces the flat background color of a scene. The easiest way to do this with an OSG Export is to take advantage of the exporter's "Background Map" feature. This feature automatically generates an infinitely distant skydome that will never accidentally cut off our models or mess with your model's clip plane. At the moment HDRI skydomes are not supported, but this feature may be coming sometime in the future. You can start off by grabbing high quality skydomes off of places like https://www.cgskies.com/, stock texture sites, or make your own with a 360 camera on a tripod (such as the Ricoh Theta) and capture through its associated remote shutter app. Various other solutions for capturing professional panoramas exist as well, such as incremental nodal camera mounts (e.g. Nodal Ninja) or automated heads (e.g. Gigapan), though these methods may have trouble stitching together moving objects such as clouds. 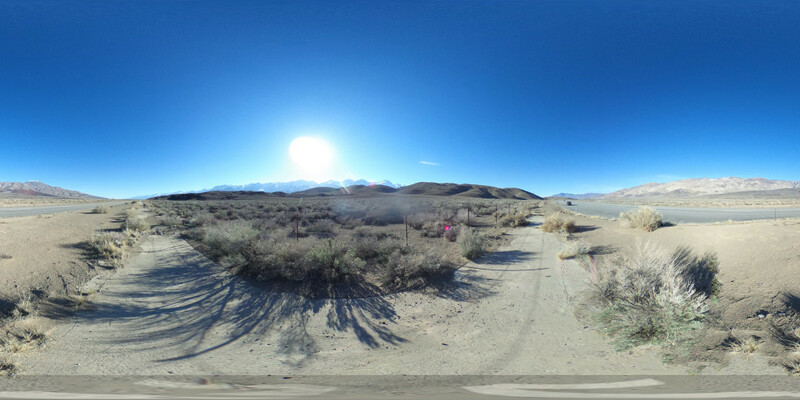 Here's a sample spherical panorama you can grab for testing, captured with an older Theta. The Theta has some stitching artifacts where the edges of its two lenses come together, but this is most noticeable when placed directly on a flat surface instead of a tripod. This version of the Theta also has a noticeable amount of color noise, even when shooting in well-lit situations with a low ISO. In this example the tripod was originally visible, edited out in Photoshop using the polar coordinates filter and content aware fill, and the photographer (yours truly) was also removed using content aware fill. This sky texture has a small worldviz logo watermark at the very bottom which should not typically be visible unless a user manages to look underneath the ground.